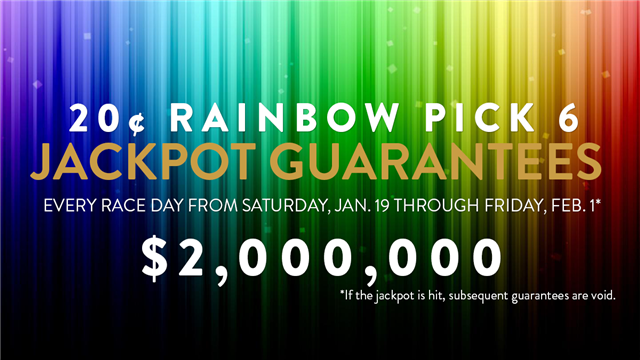 In an unprecedented move, Santa Anita Park has announced that beginning this Saturday, Jan. 19, Santa Anita will guarantee a 20 cent Single Ticket Rainbow Pick Six Jackpot of $2 million for eight consecutive racing days prior to a mandatory payout (pending CHRB approval) on Feb. 2. This entry was posted in Horseplayers, NL List and tagged exotic bets, exotic wagers, horseplayers, Rainbow 6, Rainbow Pick 6, rainbow pick six, rainbow six, santa anita by Press Release. Bookmark the permalink.